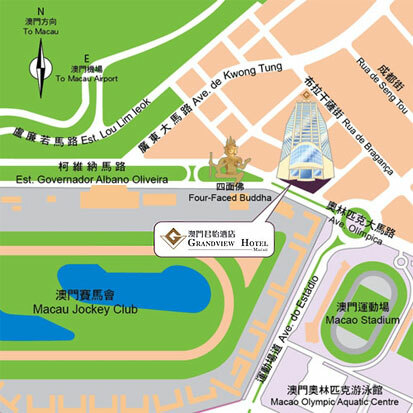 The hotel provides complimentary shuttle bus service for guests arriving at the Macau Ferry Terminal that runs between 08:15 and 21:15. Taxis are easily accessible at the Macau International Airport and it only takes approximately 5 minutes to reach the hotel. 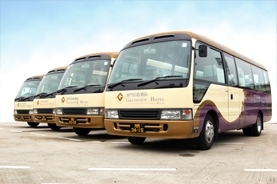 If you don’t have any heavy luggage, you may take Public Bus "MT1" and stop at the Macau Jockey Club Bus Stop (Choi Ma Wui as spoken in Cantonese). From there you have to cross the street and proceed to the right direction and in less than 3 minutes, you would find the hotel. At Portas de Cerco (Macau-China Border Gate), taxis are easily accessible, too. And just outside the border gate, you will easily find the Underground Public Bus Terminus where you can take #30 or #34 and alight at Macau Jockey Club Bus Stop.